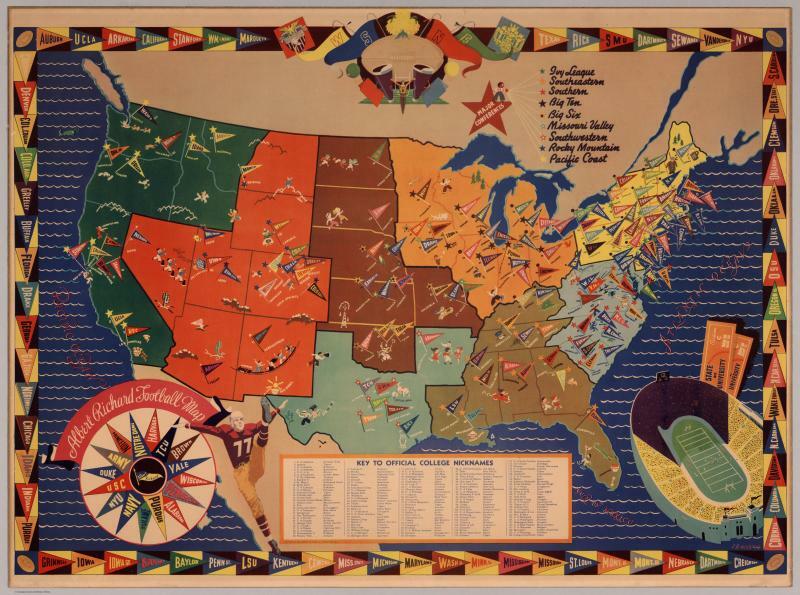 Sewanee's place on this 1938 national map of American football seemed secure until the new Vice-Chancellor Alexander Guerry announced in April that Sewanee was leaving "Big Time" football and the Southeastern Conference. Guerry’s football policy marked a major turning point in the University’s history and made headlines across the South. In 1933 Sewanee had joined with the region’s major universities to form the new conference and proceeded to lose thirty-seven league games in a row. To become more competitive, Sewanee began awarding football scholarships, which was the practice of other SEC schools but one a college with 200-plus students could scarcely afford. A Sewanee Man himself, Guerry explained that the University risked its financial security, its system of values, its very manhood in following the corrupting example of the major universities. Guerry’s actions calmed what had been a twelve-year-long crisis nourished by Saturday blowouts, perennial losing seasons, and declining funds. During that time rancor spread among students, and alumni engaged in shady recruiting practices that sullied the University’s proud reputation for honor and “Simon Pure” amateurism. Forces off the Mountain, boiling with rage, proposed radical actions in violent terms: fire the coach, sack football’s governing organization (the Athletic Board of Control), and expel the vice chancellor, Benjamin Finney. What was worse, after 1930, revenues plummeted and outlays escalated, pushing the once mighty program into arrears that cost the University precious financial resources. Throughout this time, alumni and students imagined the football crisis and its solution in terms of the manliness of the University and its students. Some described the gridiron humiliations as stinging blows to their masculine pride and confessed the team’s performances left them with a shame that only a muscled-up and winning football program could assuage. Others, including Guerry, likewise evaluated the crisis in gendered terms, but in their estimation the problem was not the losing records, the lopsided defeats, or the game of football itself. The shame was in the materialistic business of Big Time football, the pursuit of which had lowered the stature of Sewanee Men by enlisting them in an enterprise that had lost its moral bearings and elite values. True amateurism – playing sports solely for the love of playing – was not retreating from the field, but courageously restoring Sewanee Men to their heritage of truest manhood. This section examines how the 1930s reformers of Sewanee football – those who sought to win on the terms of the major programs, and those who led the University away from Big Time athletics – advanced their positions and silenced their critics in terms of Sewanee manhood. In 1922 a near-capacity crowd watched the Thanksgiving Day ritual of Sewanee vs. Vanderbilt at Dudley Stadium in Nashville. In 1928 no more than 12,000 of Tulane Stadium’s 35,000 seats saw the Greenies trounce the Tigers, 41-6, on Homecoming. Sewanee had played on twenty-eight consecutive Thanksgivings – had scheduled Alabama for that day in 1931. Vanderbilt had not deigned to inform Sewanee’s Athletic Board of Control. Vanderbilt’s paper, The Hustler, reported that officials “regretted” the decision, but the game had lost its luster. Only about 7,000 of Dudley Field’s 20,000 seats were occupied when the Commodores throttled the Tigers 26-6 in the 1929 game. “Tradition,” the Hustler explained, “must give way to materialism.” The Commodores offered Sewanee a consolation spot earlier in the 1931 season, to which the ABC responded by canceling all its future games in Nashville. Perhaps more important, the Thanksgiving contest also was by far Sewanee’s largest annual revenue source. The loss of that one game was a lethal hit to the Sewanee program. The Vanderbilt action ignited a concerted alumni effort to fire the coach, Michael Bennett, and to dismiss Vice Chancellor Finney and the ABC head, the professor W. H. MacKellar. Finney had otherwise ably led the University through extraordinary prosperity in the 1920s and through the worst of the Depression. 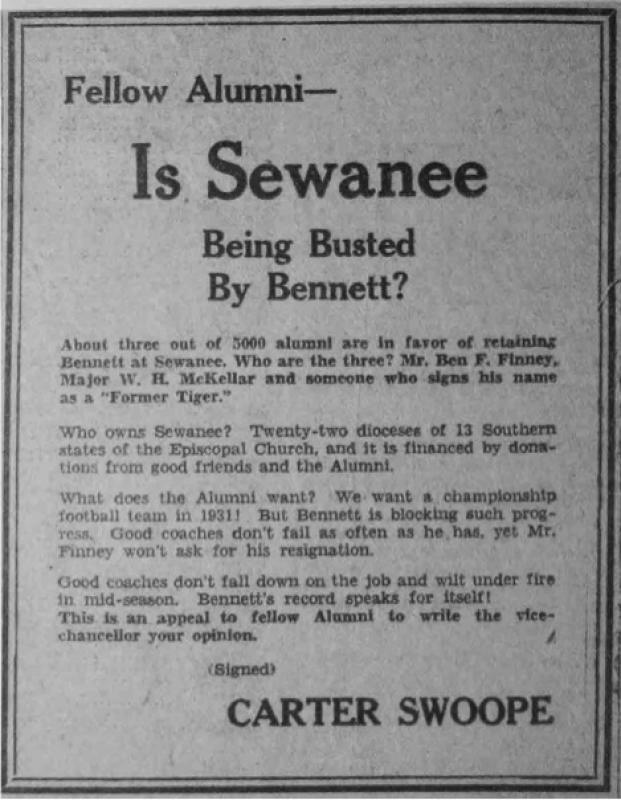 He, MacKellar, and Bennett were outspoken advocates of “Simon Pure” amateurism and fought hard against alumni patrons of the football program, who sought to stretch the rules to beef up Sewanee’s team. The documents here –letters from angry alumni, a threatening telegram that a Memphis alumnus sent to Finney, and a newspaper ad that he placed in that city’s newspaper – show that alumni critics believed all Finney and his colleagues were insufficient as men and had constructed a football team in their weak image. By the spring of 1930, MacKellar had resigned, Bennett was gone, and Gordon Clark, one of the Memphians who had attacked Bennett and Finney, was hired as the new “graduate manager,” or athletic director. … the present system has not produced a winning team, the present combination up there has sunk us to the lowest depths that football has ever fallen at Sewanee, has lost us the Vandy game of forty years standing and has made our teams an object of pity or contempt throughout the South. No change can be worse consequently…. I am indeed sorry Vandy has decided not to play Sewanee on Thanksgiving after 1930 and am very, very sorry indeed that you have decided to sever Athletic relations with our most ancient rival. A reasoning man cannot blame Vandy for her action in view of the waning interest in this oldest of southern football rivalries. People won’t patronize a weak team such as Sewanee has put on the field for the past several years. I wish to endorse the resolutions [to revive the program]. We are a weak bunch if we admit that Sewanee cannot compete with the S.C. teams…. Football and the Dangers to "Real Sewanee Men"
In 1929 the Carnegie Foundation for the Advancement of Teaching published American College Athletics, a comprehensive survey of Big Time football that found some level of cheating at almost all of the 130 institutions it studied. The most pervasive form of cheating was “subsidization” This was the practice of well-healed alumni operating secret funds to lure talented players to their schools with under-the-table arrangements like no-work jobs and secretly financed scholarships. In response to the study, some leading educators contended the amateur ideal was a sham, that football was beyond reform and corrupting the academic mission of higher education. The only recourse was to abolish the sport. 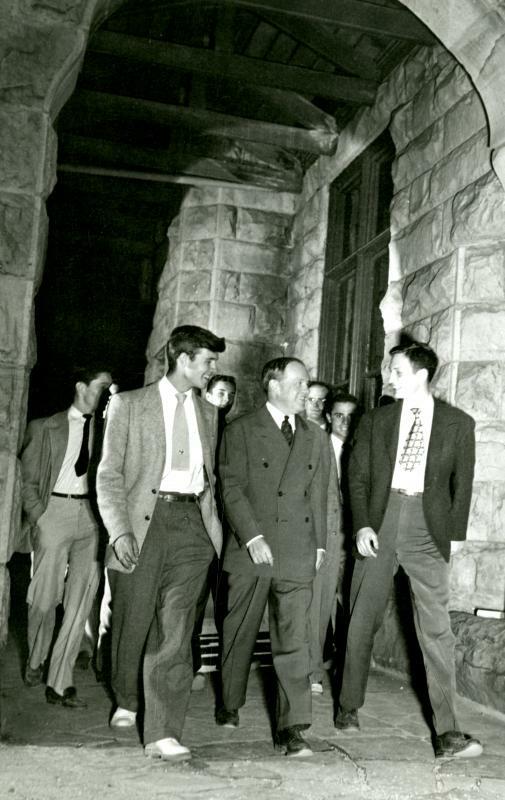 Vice Chancellor Finney and the ABC’s MacKellar staunchly defended Sewanee’s amateur ideal, but both knew that Sewanee’s hands were not clean on the matter of subsidization. (Sewanee had declined to participate in the Carnegie study.) “I yield to no man, athlete or fan, in my love of the game as the greatest of all college sports,” Finney once told students. However, by the early 1930s he and MacKellar had concluded that intercollegiate football itself was the problem and that it was undermining Sewanee’s foundation. As lopsided defeats mounted over the first three SEC seasons, alumni and students rose up to defend football’s indispensability to the manly character of the University. Without football, they warned, a toxic effeminacy would ruin Sewanee. In the examples below the football team of 1934 defends their bravery in a public statement after a disastrous second season in the SEC. An alumnus defends athletic students over non-athlete “tea-hounds” (sissies). The president of Southwestern at Memphis (today’s Rhodes College) describes the fear on his campus that ending football will lead to a “not normal” (meaning homosexual) student population. An ABC report at Sewanee manifests the same fear, apparently confirmed by a survey of Sewanee Men. I cast my vote for football scholarships. There will always be enough football players for all the colleges. Sewanee could take the left-over players after Alabama or Tulane picked their first squad of 33 men and with the “Sewanee Spirit” beat the hell out of Tulane, etc. I favor at least thirty football scholarships for Sewanee. I think an athlete with brains is more deserving than a tea-hound with brains. Yours for a better and strong Sewanee united on all fronts. So we take issue with the implication of “Sport Shots” … and we repudiate utterly the rather pusillanimous notion that we ought to beware of big brother and content ourselves with adversaries selected for supposed weakness … Of course we like to win, but if we are to be beaten, we like to feel that we have suffered defeat by those who might well be feared by better teams than ours. [Abandoning intercollegiate athletics] would seriously affect the student body of the College of Arts and Sciences and would change in a great measure the type of student body that we have. A great many of the type of athletes that we now have would not come to Sewanee if we had no intercollegiate athletics. … This solution would seriously lower the prestige of the University in the eyes of a great many of our alumni, friends, and prospective students. Many of our alumni center their affection and interest for Sewanee around our athletics. It would seriously affect our enrollment for in addition to the athletes who would not come, many prospective students other than athletes would not consider Sewanee. Question 1: Would you have come to Sewanee if the University had had no intercollegiate athletics? Question 2: If you were entering college next September as a freshman and the University had no intercollegiate athletics would you choose Sewanee as your college? Vice_Chancellor Alexander Guerry and fellow Sewanee Men. Sewanee’s departure from Big Time football did not cause the uproar or crisis that one might have expected after more than a decade of bitter conflict. The Purple editors, for instance, welcomed the new policy because it promised to share athletic resources more generally among the student population, instead of concentrating them in football. Beyond the plan’s necessity and practicality, though, Guerry won over students and alumni by making the new policy sound manly rather than defeatist. Guerry was a magnetic speaker with a commanding ego who presented himself as a powerful and vigorous chief executive. Although president of the University of Chattanooga, he was no classroom academic, but a World War veteran and a graduate of the college (1910) who had scrubbed for the football team. He sounded strong and aggressive, not weak, in ending competition with the likes of Alabama and Tennessee. Guerry spoke of reform in conservative terms of restoring Sewanee’s historic essence. Sewanee’s prestige in southern higher education, he explained, did not rest upon athletics. It was founded “upon the splendid academic and spiritual ideals … and upon the fact that her student-body now and over the years has been composed for the most part of exceptionally fine young men, gentlemen and the sons of gentlemen.” Sacrificing all to win football games with players who were paid for their athletic talent was base and unmanly. Guerry explained that the only way the Sewanee Man could remain a true Sewanee Man was by playing the sport as it was meant to be played – for its own sake by gentleman-amateurs. Alexander Guerry, “Sewanee’s Future Football Policy,” April 1938. ← "With a love, passing the love of woman for the land of the sun and the slave"